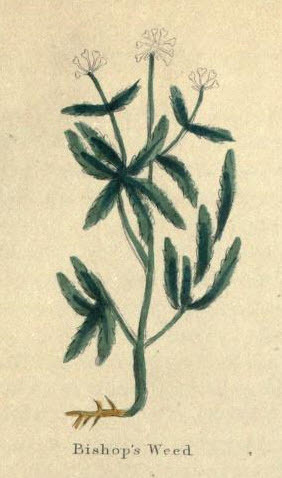 Episcopi Herba ignobilis. Some persons call it Ethiopian Cummin-seed, and others Cummin royal, as also Herb-William and Bull-wort. Common Bishop's weed rises up with a round straight stalk, usually three or four feet high, beset with small, long, and broad leaves, cut in some places, and dented at the edges, growing one against another, of a dark green colour, haying various branches, and at the top small umbels of white flowers which turn into small round seeds, like parsley seeds, of a quick hot scent and taste. It grows wild in ninny places in England and Wales, as between Greenhithe and Gravesend. It is hot and dry in the third degree, of a sharp bitter taste. It dispels humours, provokes urine and women's courses, dispels wind, and taken in wine it eases pain and griping in the bowels. It is used with good effect in medicines given to counteract the poisonous operation of Cantharides upon the passage of the urine. Mixed with honey, and applied to black and blue marks, produced by blows or bruises, it takes them away.